A lot of people are reluctant to openly declare that they are happy because they are afraid that people would be jealous or react negatively. Happiness Happens Day was created to encourage people to share their happy news without feeling bad about it. There’s nothing wrong with being happy and sharing your happiness with the world! Happiness Happens Day was first celebrated in 1999 as Admit You’re Happy Day. 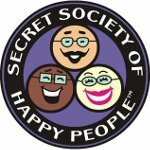 The date of August 8 was chosen because on this day in 1998 the first member joined the Secret Society of Happy People. The next year, the Society declared August as Happiness Happens Month. If you want to celebrate Happiness Happens Day, you can join an online social media event known as HappyThon. Its aim is to send inspirational messages and share happy moments via texts, emails, or social networks. Another tradition of Happiness Happens Day is toasting with pink lemonade. Why pink lemonade? Lemonade is a reference to the proverbial phrase “When life gives you lemons, make lemonade”, and pink is just pretty.